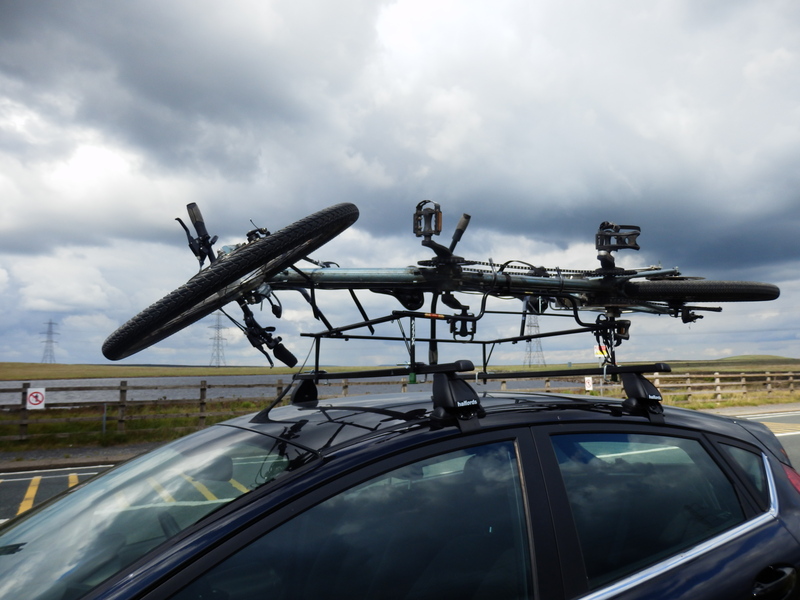 In this section you’ll find information about how we found the right tandem; the modifications that have helped; the electric wheel; and the tandem roof rack, which are all contributing to make tandem travel work for us. The roads around West Yorkshire are mostly very steep or very busy – a tandem that can be used on good woodland paths, canals and old railway lines was needed. 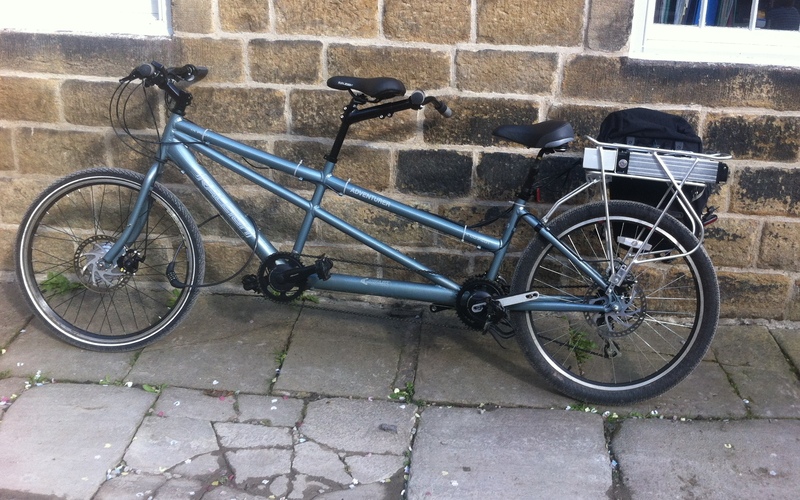 A little research came up with a mountain tandem – a fairly ordinary tandem but with fat tyres and plenty of gears. The trouble with tandems for someone who suffers from fatigue is that the rear pedals go around with the front ones, which makes even coasting tiring. 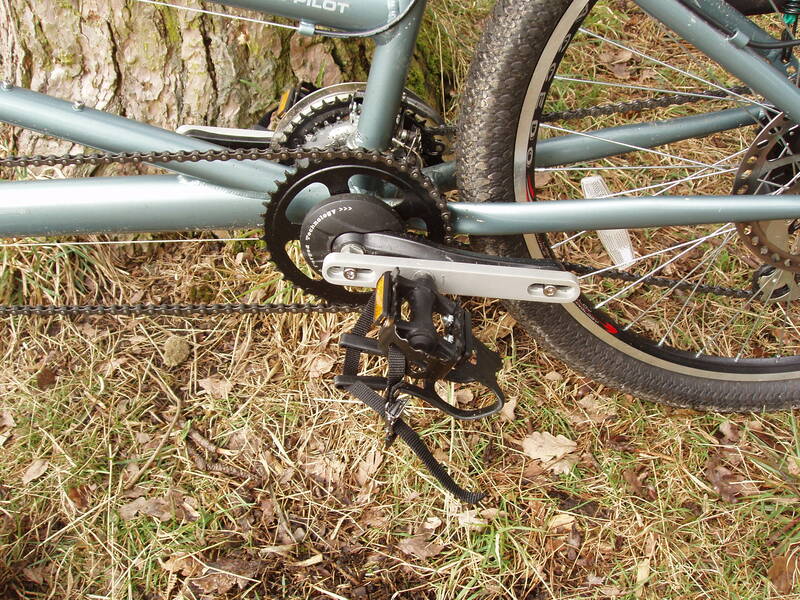 A solution is to use some crank shorteners – the feet still move around, but (with the right type of crank shorteners) the stroke can be reduced down to as little as a few inches. This reduces fatiguing motion to a minimum while keeping the option of pedalling. The pedal clips (that came with the tandem) are also very useful for relaxation. Another problem is bottom comfort – not pedalling much keeps the weight firmly on the bottom giving a painful derriere much more quickly than normal, and don’t even mention the effects of bumps! The fat (balloon) tyres that came with the tandem help with the bumps, especially if they are kept at the lower end of the pressure scale (about 30 psi/ 2.3 bar). A large ‘comfort’ saddle with springs and gel increases comfort considerably and we found it near-enough essential. A last improvement is a sprung seat post which absorbs some bumps, though it needs a very regular squirt of oil to keep it working. Raleigh Pioneer Adventurer Tandem Mountain Bike (available from www.amazon.co.uk). Plenty of gears and fat tyres welcome for bumps. Crank shorteners: Thorn crank shortener (from eg www.sjscycles.co.uk).Can be adjusted right down to a few inches throw (by fitting upside down). 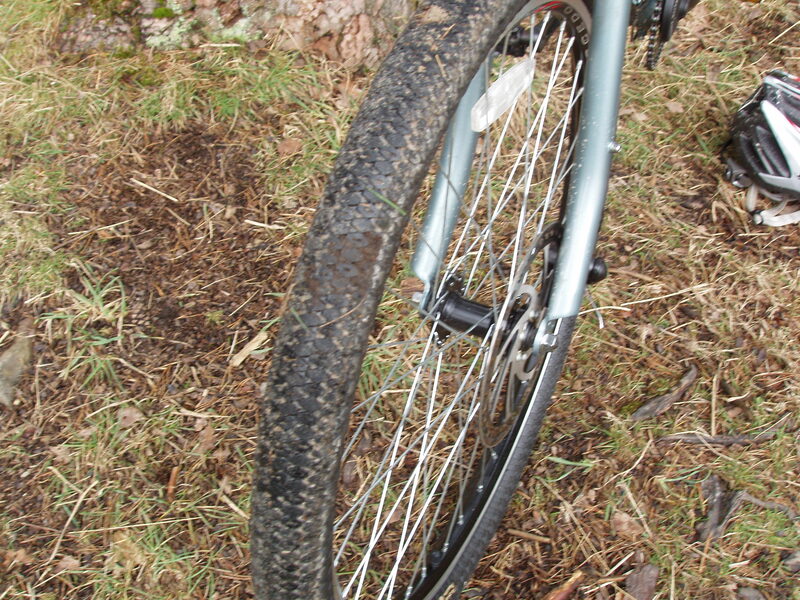 Wide saddle: Widely available with springs and gel for comfort (eg Halfords). Sprung seat post: Systemex sprung seat post (eg from http://www.edinburghbicycle.com). 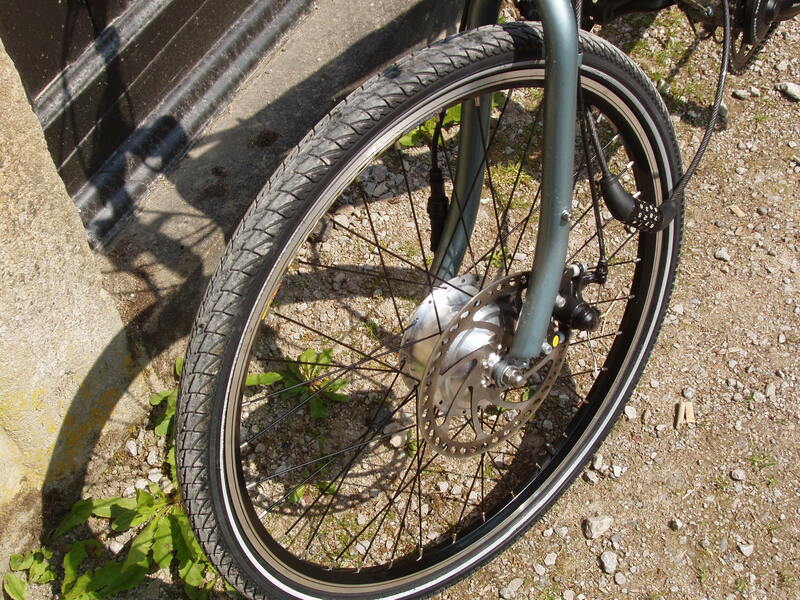 There are all sorts of electric wheels and battery options to be found on the net; generally the ones that fit the front wheel are easiest to fit. We needed one that was suitable for the front brake disk of our tandem, which limited choice considerably, but a good road legal kit was found from Alien Ocean http://www.alienbikes.co.uk/ which is a well-established company and I can vouch for the clarity of their fitting instructions (no ‘lost in translation’ instructions) and their after-sales helpfulness. 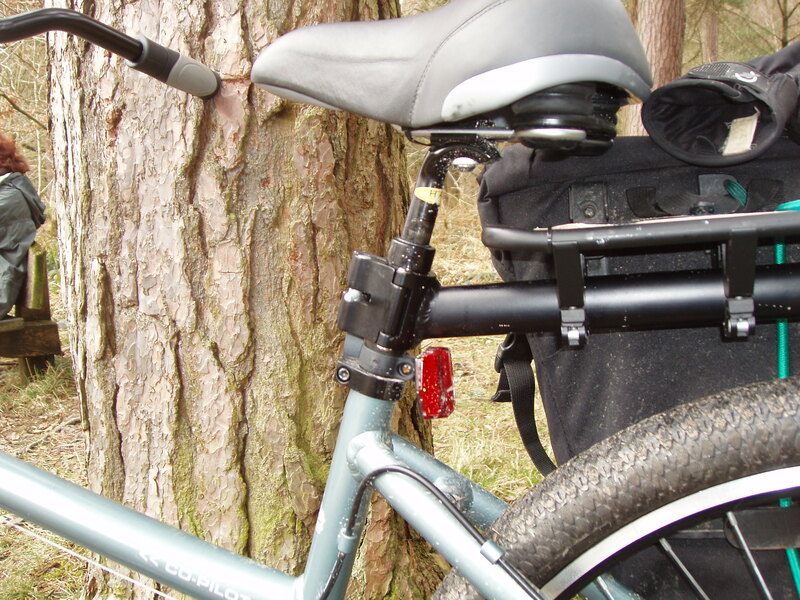 The electric wheel fitted very easily in half an hour, fitting the rear rack (which holds the battery) required a little mechanical improvisation (p-clips and long bolts with extra nuts as spacers to fit the rack around the rear disk). The electrics then plugged together easily, and to my very happy surprise the supplied electrical cables were (just) long enough for the tandem. All-in-all it took about 3 hours’ work, with a few days’ break in the middle for the p-clips to arrive (obtained from Evan’s cycles). The test run revealed: the electric wheel was great at taking the strain off my (partially recovered) knee, and it made uphill sections that used to be a strain really rather relaxed! It’ll go along the flat happily at about 15mph and easily doubles the speed up hills. The general impression is that you have an additional good pedaller helping you along, which is about perfect for our uses! Over the two years since fitting, it has proven very useful and reliable, and predictable as to its range. Used as an extra help when needed, it’ll easily cover 25 miles and still have enough power to help up the steep hill back home. Steep hills sap power far more quickly than flat roads and are the effective limiter of range in a hilly area; altogether it makes it realistic to take on hills and bridleways that would be too much without it. 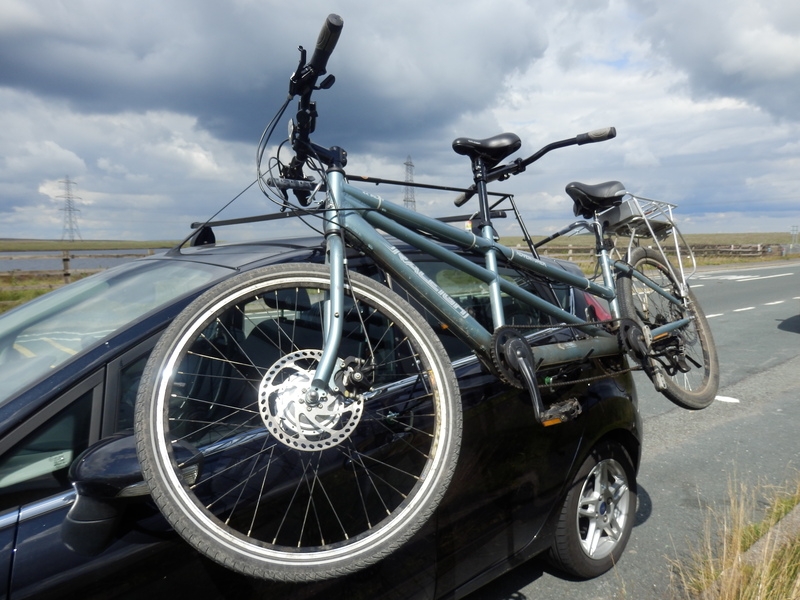 The ability to carry the tandem on the car lets us go to distant (very tasty) roads and old railway line routes. Many of these get well out into the wilds such as the Monsal and TissingtonTrails in Derbyshire and the old line from The Lion Inn in the North York Moors. For two years we used a standard rear bike rack, and took the wheels off to keep the width to reasonable limits. This was a bit of pain as the chain had to be wired firm, and something done to prevent the brake pads from falling out in transit. Driving was also a bit tense as even with the wheels off, it protruded too much for comfort. All in all, the hassle was enough to stop us doing it often. A standard tandem roof carrier was considered, but as Mary can’t always help much with lifting it has to be do-able by one person. The chances of one person lifting a tandem on the roof carrier without mishap was thought slight … then the ‘Helton Tandem Carrier’ (www.heltontandemcarrier.co.uk ) was spotted after much searching. 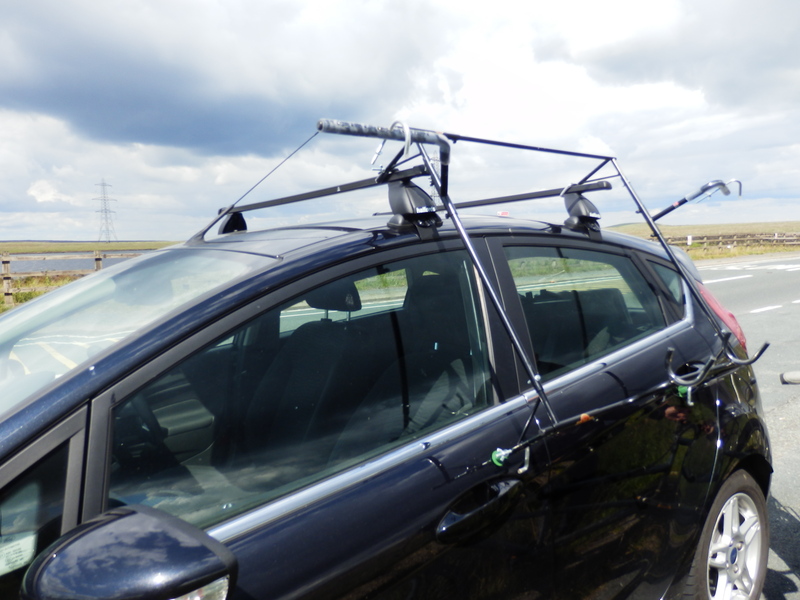 This ingenious device fits to a roof rack and pivots onto the side of the car, so that loading the tandem needs a lift of only about 2 feet, and is easy for a single able-bodied person to do. 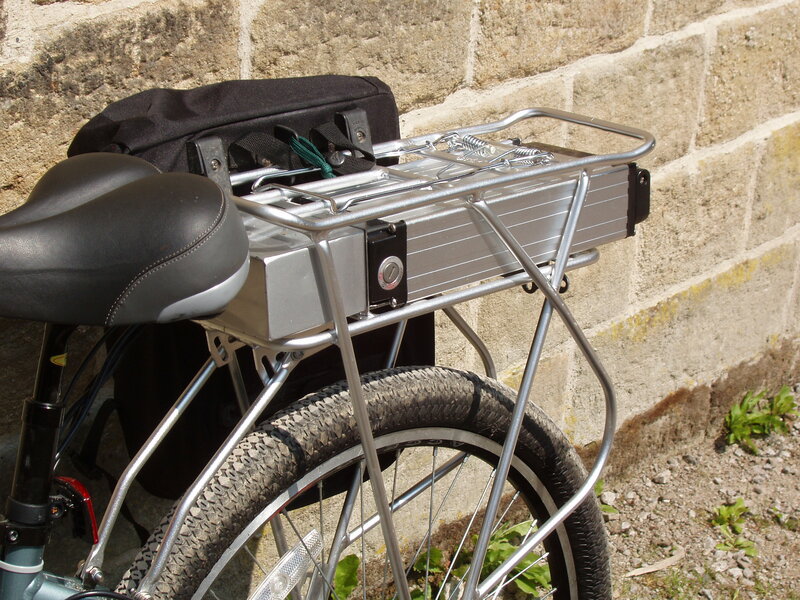 Once on the side, it’s a very easy matter to slide the rack and tandem onto the roof using the natural pivot where the rack connects (see the video in the link). It’s carefully designed, easy to put on and take off, and light to store away. After a few hassle-free trips (including a 200-mile journey to Wales) it’s been trouble free and completely convincing – plans for trips to distant places have greatly increased! Strongly recommended! Thanks to Pete for this section! I’ve very much enjoyed reading a few of your blogs having read the little piece about you in the current msmatters. Great to find somebody else with MS who enjoys tandeming and getting out into the countrside. We have a tandem trike – some advantages and some disadvantages – and I also use a handcycle. We have a web site called cyclingotherwise.co.uk. Would you be interested in writing / adapting something to go on our web site? We would be especially interested in a piece on the electric wheel, forou Kit Reviews, but anything else – especially comment on what cycling has meant to you. It is hugely i mportant to me too and I also feel, like I guess you do, a need to spread the word. a tandem trike – what a great idea! I’ve had a little look at your website and it’s wonderful to see that such a site exists! I particularly like that you mention the Paralympics – I also found them inspiring. I ignored the competitive aspect(!) and enjoyed how much everyone got out of being active. Yes, I do feel that I want to spread the word due to how much of a difference it has made to my own life so I’d be very happy to contribute something. It’s great to find that other people are also able to get back outdoors again one way or another. Up, Up on to the Moors!